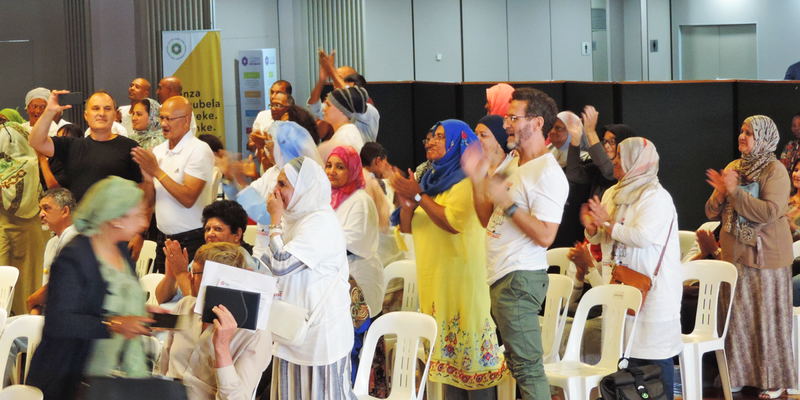 Community members stand and cheer as Jackie Poking finishes her presentation at the public hearings, held on 09 February 2019, about Bo-Kaap becoming a heritage protected site. Photo: Aisha Abdool Karim. Bo-Kaap, the oldest Muslim community in the country, has faced issues about gentrification as building developments clash with the area’s traditional history. Residents have consistently called for the area to be given heritage status. At a public hearing in Cape Town at the weekend, residents warned again that the area on the slopes of Signal Hill needed to have heritage protection status or its rich cultural history could be wiped out. Bo-Kaap must have heritage status — in a sustainable way that benefits the community — said residents of the oldest Muslim settlement in the country. 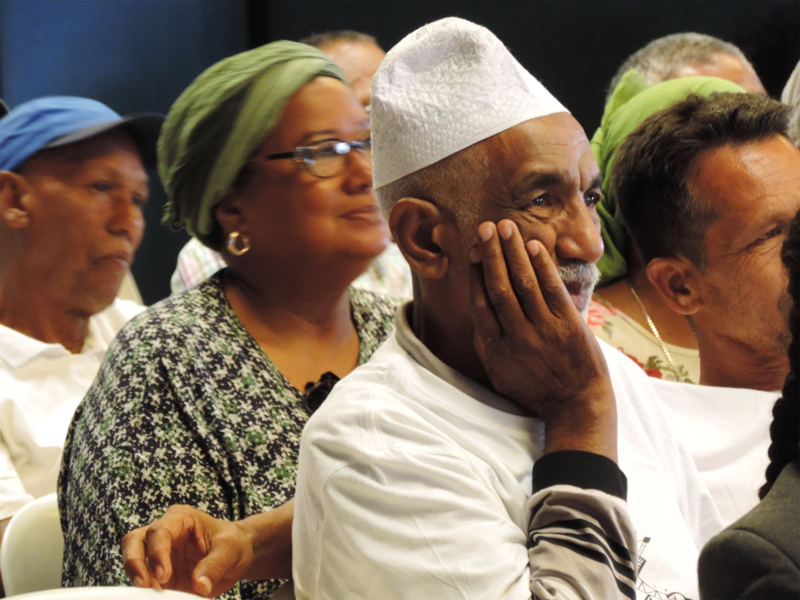 The residents spoke at a public hearing on Saturday 9 February as part of the City of Cape Town’s public participation process for a planned Heritage Protection Overlay Zone. 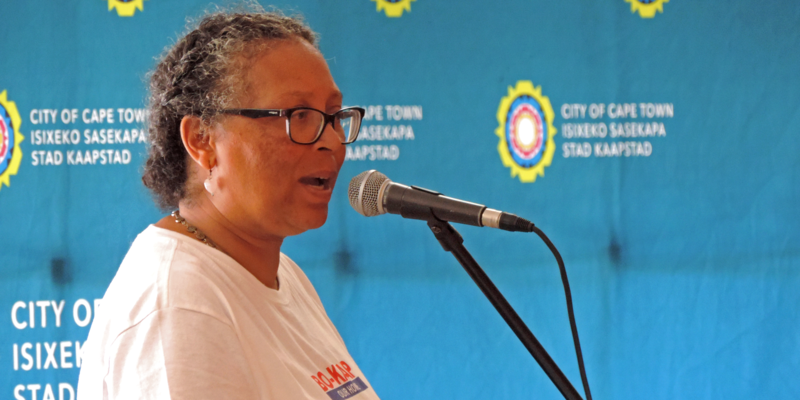 “Gentrification and the loss of community — these are the results of not having heritage protection,” said Bo-Kaap resident Jacky Poking, secretary of the Bo-Kaap Civic and Ratepayers Association. Poking spoke on behalf of the association on Saturday afternoon at the Civic Centre in Cape Town, where a day-long public hearing was conducted by the City of Cape Town on views about a planned heritage protection zone for the area. “Bo-Kaap is a way of life”, and those who would have to move of the area due to high property values and rates increases would struggle to live elsewhere, said Poking. Bo-Kaap dates back to the 1700s, when liberated slaves moved into the area, which was also home to political exiles from the islands of Java (in Indonesia) and Ceylon ( now called Sri Lanka). The oldest mosque in South Africa can also be found in the area. Today, the community, consisting of mainly older people, have been battling high rates, property rates increases and new developments which leave the area full of dust and noise. It has also left a gap between those moving into apartment block developments and families who have been living in Bo-Kaap for generations. “Because of this, we have a ‘them’ and ‘us’,” said Poking. One such example would be the November 2018 protest by community members against a new 12-storey development under construction in the area, one of 15 planned gentrification developments. During the 2018 protests, the community formed a blockade against the arrival of a building crane into the area. GroundUp reported on the community’s protests. Read it here. Images of elderly women being abused by the police went viral — and in one instance, Poking’s daughter, Kirsten was filmed being dragged by the police. View that video from OpenNews HD here. At the Saturday afternoon session, which Daily Maverick attended, about 70 residents and members of civil society who were present were unanimous that the heritage protection zone was necessary. That morning, developers had been granted the opportunity to submit verbal submissions. “Our heritage is not just colourful houses — it is our streets, our environment,” said Seeham Samaai, director of the Women’s Legal Centre, whose grandmother lived in Bo-Kaap. Samaai spoke fondly of memories of growing up in her grandmother’s home and the iconic cobble streets. “I want my children one day to walk down that street with high heels,” she said, as the audience laughed and clapped. But Samaai talked seriously about the planned heritage protection zone, which she insisted must benefit the area and protect its water, land and food sustainability. A final heritage protection zone would be an extensive “living document” that would determine the heritage and environmental impact any potential development would have on the area — before any construction took place, said Samaai. She said the area needed a safe hub, a place for sport and a safe space where children could play. Bo-Kaap needed an area where intergenerational interaction could take place, where someone would be able to say “this is how you make a koeksister”. A draft for a heritage protection zone for Bo-Kaap dates back to 2013, when the City of Cape Town had initially launched the process. This was approved by the city council in 2016, according to the City’s own documents. The heritage protection zone is currently in a draft form, pending the results, amendments and additions once the public participation process is complete. The document is separate from declaring the area a heritage site, but would dictate a strict process guided by the areas’ environment and cultural history on any new and potential development in the area. 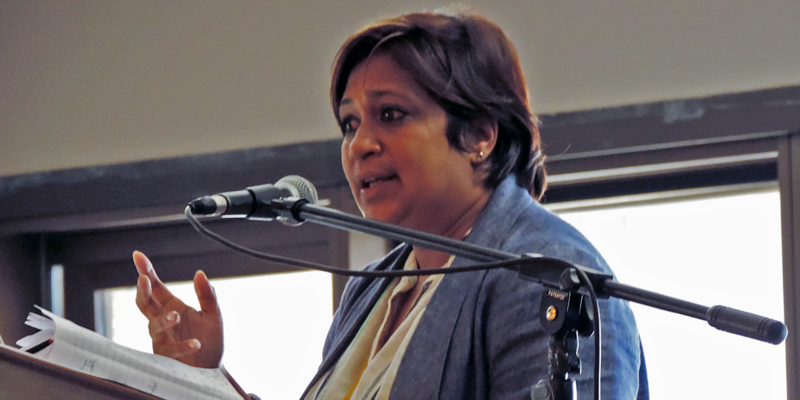 At Saturday’’s session for residents and civil society, both Poking and Samaai questioned why the process had been stalled since 2016 under the Patricia de Lille administration, which ended in October 2018. “We need an inquiry — very important,” said Poking. But Poking and Samaai were also concerned about the structure of the hearings, and questioned what they said were separate hearings for the developers and the community. Responding to queries from Daily Maverick, Mayco member for spatial planning and environment Marian Nieuwoudt said that all parties had been invited to attend proceedings for the full day, and that nobody had been excluded. Nieuwoudt said that all organisations and structures known to the City had been invited. The City undertook a pamphlet drop in the demarcated area and all property owners received a letter of invitation to submit comments. She said the City was awaiting further input and the hearing was supplementary to the broader invitation to stakeholders to comment on the draft heritage protection zone. * A sentence about Plato and Nieuwoudt was removed from this article for accuracy at 10.15am on Monday, 11 February 2019. Both Plato and Nieuwoudt were present during the afternoon hearings.